The temperature has been around 31 C all day today and I have decided I'm just not programmed to cope with that kind of warmth at this time of year! [That's typically British - never being content with the weather.] Even a Sicilian acquaintance I bumped into in the supermarket this morning said she was ready for some cooler days now. When I returned from Britain I think I did the cambio di stagione [season change] of my clothes a little too enthusiastically: I donned my autumn and winter blacks and then a neighbour asked me if it was for il lutto [mourning]. It was nice of him to be concerned but it made me change back to lighter coloured clothes! I think a lot of the women here don't quite know what to wear at the moment: denim ensembles seem to be a good solution until the weather makes its mind up. 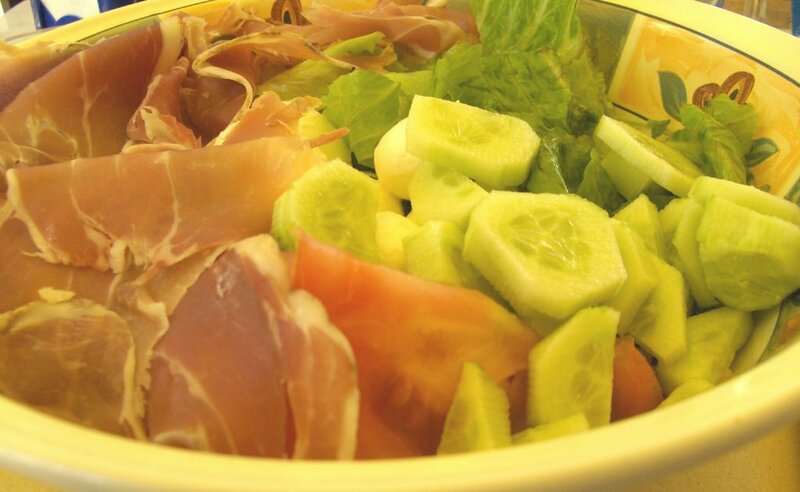 Here is the Altro Posto's satisfying salad of rucola [rocket], cucumber, prosciutto crudo, tomato and mozzarella, served in a homely, deep bowl at lunchtime today. 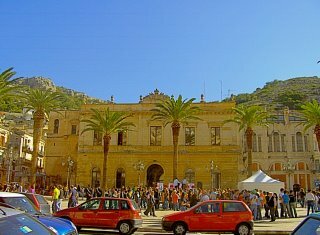 Students were demonstrating against water privatisation in Modica Bassa this morning. My political instinct would normally be to agree with them, but after the problems of the past couple of days, I'd back anything that might lead to an efficient water supply! I must say the demonstration was a good-natured and well-ordered affair, and the cafés were doing great business! The temperature has again been 34 C [93.2 F] outside today and there has been none of the summer humidity which is so disastrous for my hair. So I have enjoyed myself and it has been one of those days when I have been pinching myself to make sure I wasn't dreaming: do I really live in a place where you can have lunch outside comfortably as late in the year as 27th October?! I'm not an outdoor sort of person at all and in Britain hated eating outside [too much hassle from wasps and so on] but here I am quite partial to the activity amid the lunchtime cacophony of the busy Via Sacro Cuore and under the shades of the Altro Posto's terrace. We have water in the apartment block as of about half an hour ago [though for how long, I wouldn't like to say. Apparently there has been exceptional demand due to the high outdoor temperature - 34 C and that is high even for Sicily at this time of year.] In the end, I rang the private water supplier to whom the comune had contracted the job myself, and begged them to come tonight. Whether that did any good, or whether they were on their way anyway, I do not know, as when they appeared I just told them how glad I was to see them. So now I have had a long soak in a hot bath and the world is looking altogether rosier. The comune water lorry has been up and down the street three times to my knowledge today: it called at the house next door, only there was no one there to open the gates to it, and apartment blocks up and across the road. The last time I saw it I went down and spoke to the driver, who said he didn't have the requisite piece of paper to allow him to fill up our cistern. It's no good having a go at him - it's not his fault - so I came back up and phoned the water office yet again. This time they said that our block's request had been contracted out to a private water supplier and that they would ring this company immediately. This was at 4pm and it is now 5.45. [Italian officialdom has a different concept of immediacy from the British one!] I think the entire zone must be affected this time as the woman in the house directly facing this condominio is also waiting. 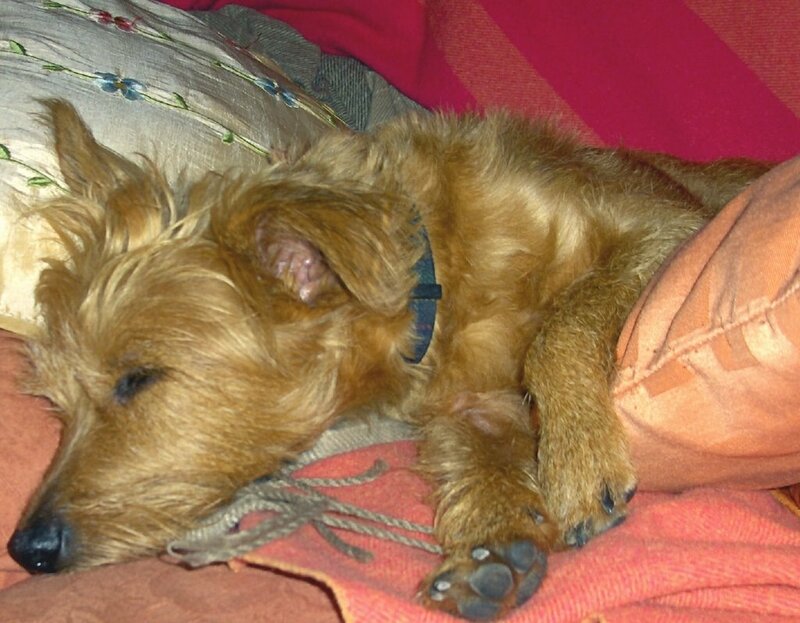 My pazienza is not doing very well today! I wrote some time ago that I fully expected some of the friendships I had forged here in Sicily to change when I came to live here, simply because being "the resident" is very different from being "the visitor". Yet this has only happened, so far, in one case. Surprisingly [to me, at any rate] it is some of my friendships in Britain which have changed or ended and I was very aware of this when I was there last week and found myself having to "prioritise" my friendships. Pettiness aside, are the people who don't bother to write, put a European stamp on and post their Xmas cards to Italy a few days earlier than those destined for UK addresses really friends? And in these days of emails and texts there is little excuse for not staying in touch; you can always write a quick line to explain how busy you are! A friendship, by definition, cannot be one-sided so one of the people involved in it cannot go on indefinitely making all the effort. Therefore I have had to admit to myself that some of my British friendships are past their sell-by date. This hurts in any circumstances, but particularly when you are away from your own country, and it probably hurts more when you do not have a family, as your friends are likely to mean more to you. It is, perhaps, something for which you should mentally prepare yourself if you are thinking of moving abroad. It is not a tragedy, but it is a kind of "loss", at a time when you are having to cope with so many other changes - no one who hasn't done it can imagine what it is really like, as people tend to see only the positive side - and could do with a little moral support from the place you used to call "home". Gosh, I am melancholy today! It's all because of the non-appearance of that darn water lorry! ... for the water lorry to appear. I phoned the office again at 12.45 pm and was told they had had a lot of requests and that they think it will come today! This situation makes me really grumpy as I cannot move properly, not having been able to have a hot bath. For those of you not familiar with this blog, I have written here and here about the water situation as well. Meanwhile, I wait! - The lorry will come, but it may arrive late tonight or some time tomorrow. British readers may be interested to know that a debate similar to the one in Britain regarding the Muslim veil is currently taking place in Italy. Woof, woof! Hello, everyone, this is Simi! My mummy didn't put a photo of ME on when she announced she was back so I thought I'd do it myself while she is having her lunch time gin and tonic at the Altro Posto. [She thinks I don't know what she gets up to over there!] I help her blog most days so I know what to do. I had to go to kennels while she was in Britain - where we used to live - buying more books to stick her nose in instead of paying attention to me! I've been in kennels before but I did wonder what the Italian ones would be like. Actually, they were very pleasant and the food was good, as a dog would expect here! 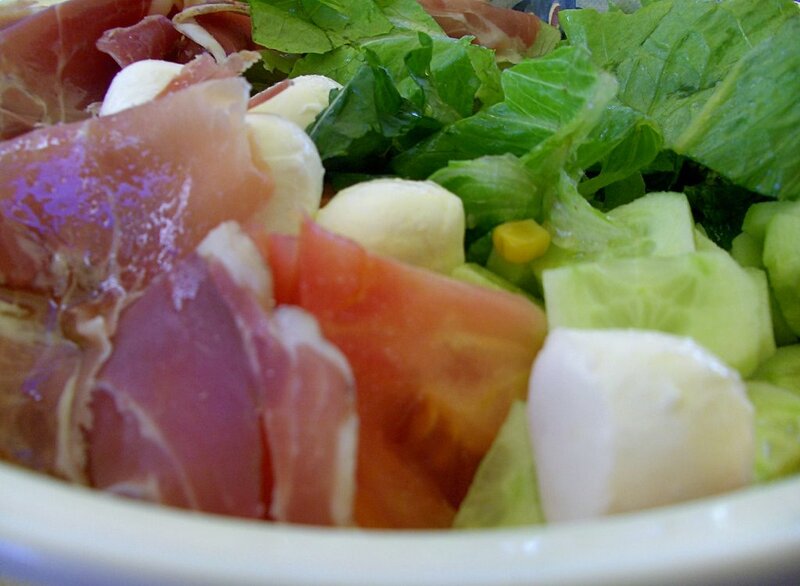 [Later, my mummy told me she had given them the best prosciutto to sprinkle on my meals.] I enjoyed playing with the man at the kennels: I learnt lots of Italian and he told mummy I had shown myself to be very educata [= well brought-up]. But I like having my mummy back, along with my nice, soft place to have a snooze. I have just taken the Marks & Spencer trousers I bought last week over to the little tailor's shop to be shortened. They will be ready by Friday. I am always pleasantly surprised by how easy and quick it is to get such alterations done here, as in Britain these days it is quite difficult to find someone who will do them. The weather here in Modica today is, quite simply, beautiful. It is warmer outside the apartment than in it, the sun is shining and in Britain this would pass for a day of high summer. The women have mostly changed into autumn garb but today you could walk around in a sundress. We may not get golden, falling autumn leaves here - or not many of them - but we get days like this one to gladden our hearts. Upon landing in Britain I realised I had over an hour to spare before catching the Cardiff coach so, as it was lunch time, decided to go and have something British and stodgy in the airport pub. This is one of those establishments that only the British could dream up, in which you have to find a table, note its number, then go and order your food at the bar. This is rather a difficult process if you are on your own as while you are ordering, someone else could come along and sit at the table, and of course you can't leave any items at the table as they would either get stolen or taken away by security! So I was cheered to see a notice, prominently displayed on the bar, saying, "TRAVELLING ALONE? TAKE ONE OF THESE RESERVED SIGNS, PUT IT ON YOUR CHOSEN TABLE, THEN COME AND ORDER YOUR FOOD AT THE BAR". But where on earth were these signs? "Oh, we ain't got any", said the barman unhelpfully. "Why have you displayed that notice, then?" I asked. "Oh, well, luv, we only ever 'ad about three signs anyway. It'll be all right if you've got somebody to mind your case while you order." [Not a single "Sorry", you will note, during this conversation.] "But I haven't - that's the point", I replied, at which he just shrugged. "Yeh, right... Welcome to Britain", thought I. No Italian barista would ever be so off-hand with a customer or, if they were, they wouldn't be a barista for long! On the Cardiff coach I noticed, anew, how selfish we British are in our travel habits, never moving our bags and coats from the empty seat next to us unless we absolutely have to. Indeed, I see from the National Express website that you can now reserve the seat next to you as well on some routes, even if you are travelling alone! What madness is this? Are they going to run twice as many coaches to make up for these "taken" seats? Then I cried again as we came to the bridge and crossed the murky old Severn into Wales. Cardiff seemed surprisingly unchanged as the coach drove through and later in the week, walking around it and doing things I had always done there, I found myself having a "reality check" every now and then: "I'm here and I'm doing this but I am not part of it any more." Weird. The one thing that would strike anyone coming to Britain from France or Italy [and, I would guess, also Spain and the USA] is how expensive it can be to eat well there. I did enjoy some glorious breakfasts but on the Saturday ordered a Caesar salad at lunch time in a café which is usually OK: on this occasion the lettuce was limp, the croutons were soggy and the parmesan shavings looked yellow and stale to me. [I appreciate that this last was probably because I have been spoiled by the quality of the stuff here.] In Cheltenham my friend laughed at me as at 1pm I was straight out of the Festival and into the Italian restaurant opposite - one place where you can eat well, though, as I've said, you have to be prepared to pay a lot for it. On the Saturday night I did enjoy a fantastic Chinese meal with friends in Cardiff Bay for a reasonable price. Shopping for clothes in Britain was a pleasure and a relief, mostly because they are displayed so well inside the shops and you are left free to browse. And I know M of myhearthurts will appreciate this: oh, the joy of just picking up underwear from the shelves! However, I couldn't help noticing that, even in quite prestigious stores, some sales assistants could hardly drag themselves away from their conversations with colleagues to serve you, or showed their reluctance at doing so. And the way they can't be bothered to say "goodbye" got to me! In Italy you get a string of salutations - "thank you, goodbye, have a good day, enjoy your lunch, always at your service" - all in the same breath and it does make you feel that your custom is appreciated. Food shopping, on the other hand, was a disappointment [except for again finding the large range of foreign spices available in Britain], as the fruit and vegetables looked tired and past their best; but again, in that respect I've been spoiled in Sicily! It's funny, though, how when you are away you have memories of certain shops in your own country, then when you go back and visit them you realise that they were nothing special anyway. For the bibliophiles among you, my enormous book collection is now the richer by about twenty more tomes, some of which I posted to myself here to save on the weight of the case coming back. I must admit, at Bath Post Office, I got served then nearly stood in the line all over again , just for the pleasure of being in a post office queue which moves! I noticed, too, British reticence: no one is really interested in where you have come from and if they are not friends, they rarely ask you a follow-up question. This is so unlike the Italians, who want to know all about you and will even ask you how much you earn and how much rent you pay [taboo subjects in Britain]. Maybe I've opened up and become a bit more Italian in this respect. When you read about what is going on in Britain from over here, you get the impression that it is now a very polarised society. This is not the fault of the Italian media; it is, rather, that you read all the negative things because these are what get reported everywhere but what you read is not balanced by what you see and do when you live in Britain. So I was pleased and relieved, in Cardiff, to see people of all cultures going peaceably about their everyday business together just as they always had. I did receive the impression, talking to some of my compatriots, though, that British tolerance is at breaking point. This is sad because I do think the British are the most tolerant people in the world of difference, whilst Italians are more tolerant than we are of noise, children and inefficiency. Don't lose that precious tolerance, Britain; you will be the poorer for it if you do. Having said that, a sensible and open debate on some issues has to be had and I think this is beginning in Britain. So now I am back on my "other island" and as the plane came in to land upon Italian soil, I thought, "I'm in trouble if I don't cry now as well". And of course I did. I was "home" in the "land of lands", a land I had longed for and dreamed of living in for so long. 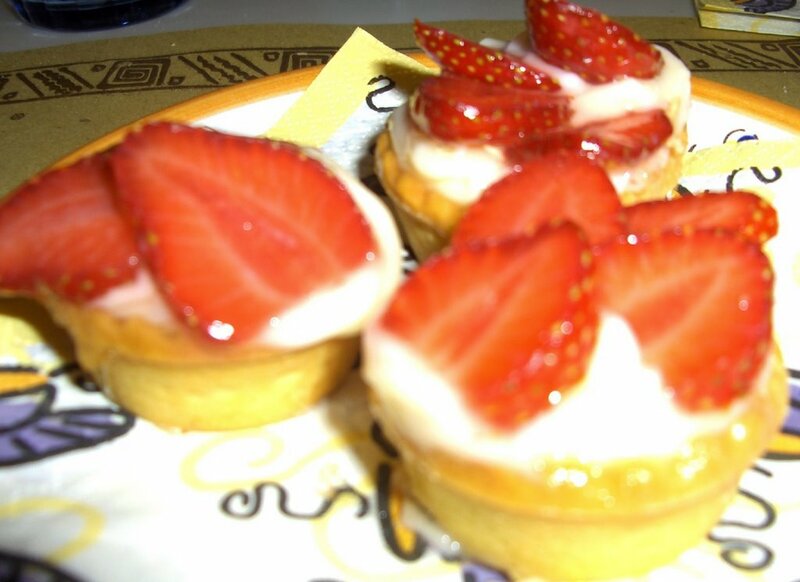 And the next day, as I walked down the street and was greeted and welcomed back by neighbours and shopkeepers alike, and as I smelled again the aromas of Italy - vanilla on freshly baked dolci, tomatoes on bruschette, cotolette being cooked in apartments - I was glad to be here. Little streets, little houses, carpets, fast-filling bathtubs and breakfasts - these are things I will miss - but I have my compensations. 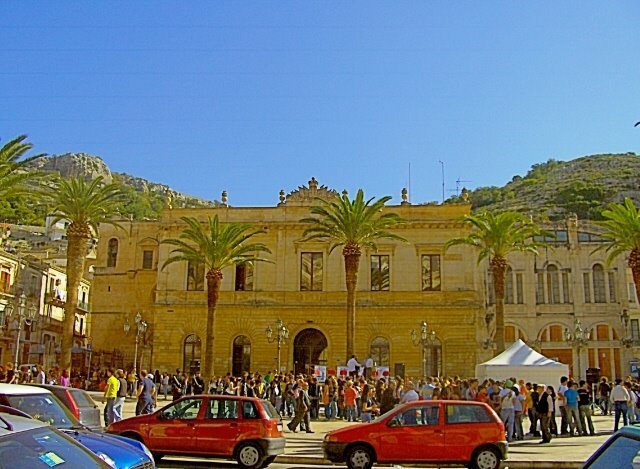 And I miss my British friends, of course, but I have been incredibly lucky in having wonderful friends in Sicily, too. "And for those of you who stayed to the end", as my online friend Ballpoint Wren would say, and for those of you who are also dog-lovers, I am glad to report that Simi is fine: on Thursday night she was brought back, rushed in, rolled in turn upon my bed, her bed, the settee and her floor cushion, decided, "That's all right, then" and snuggled up to me to watch TV. And so we are home, dear readers. I have had a week in the UK and I am stanca morta [dead tired] which is why I didn't post yesterday , as promised. My main reason for taking a quick trip back [note that I am not saying, "home"] at this time was to attend the Cheltenham Festival of Literature and to take advantage of the direct flights at this time of year. "To begin at the beginning": before I went, I surmised, correctly, that I would have a lot to do there in very little time so I decided to be a vengeful and petty woman; I got last year's "sent and received" Xmas card list out and anyone who hadn't been bothered to send me the compliments of the season got scratched off my "to see in Britain" list [as did acquaintances who haven't tried to stay in touch, at least periodically]. That refined it nicely. 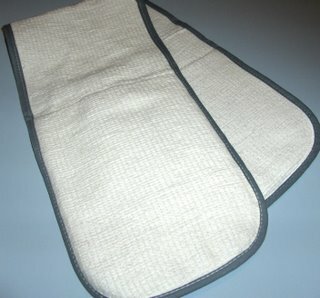 Then I made a shopping list as long as your arm, full of daft things that you'd never think you'd miss, like joined-up oven mitts, a plastic apron, freezer pens, a bath pillow and dried cranberries. Thus prepared, I was ready to set off on Wednesday 11th. Raffaele the helpful hairdresser got one of his staff to drive me down to the Catania coach stop in Modica Bassa [it stops up here, only not always, and I have seen people running after it whilst encumbered with suitcases] and another friend had rung and offered a lift earlier that morning. People are very kind like that here, as, indeed, are friends in Britain, offering lifts from Cardiff bus station to the friend's house where I was staying. But now I would like to take up with the AST coach company the matter of the design of the buses on that route. For the last three years or so they have been double-deckered and the luggage compartments are so high up! [The driver does not load and unload for you, as in the UK.] This is completely mad on an airport route as people are bound to be travelling with heavy cases. Usually there is some kind soul around who helps me but what if there wasn't? What is the reason for such a configuration? On that Wednesday night I stayed at my usual Catania hotel [part of a large chain] , which is always very pleasant. But there is another design issue and this goes for the London Gatwick hotel where I spent the following Wednesday night as well: the bathrooms in both hotels have been replumbed since my last visit and the showers are ridiculously high! They are still telephone taps, not those overhead things that spoil your hair [and no, it is not OK with a shower cap!] but you need to be at least six feet tall to be able to reach them! This must be an innovation thought up by a man and, again, what is the reason for it? Bring back telephone-type showerheads attached to the bath taps, please! At the Catania hotel, I noticed a lot more guests dining alone than I ever had before there and a good proportion of them were women. This says a lot about the way businesses are developing and a lot about women's confidence. [I'm always amazed at women friends, mostly in Britain, who tell me that they won't go and have a meal alone in a hotel restaurant; for god's sake, what is the point of being there, then?!] I am glad to report that the Catania hotel still has mini-bars in the rooms, a practice which most British hotel chains seem to have abandoned, presumably because we are such a dishonest lot; therefore I had the dubious pleasure of being charged £4.25 for a bottle of mineral water to take to my room in the British establishment. I also noted that the Italian hotel chain has not yet felt compelled to make the coathangers unstealable - I ask you, what Italian would be so unstylish as to want them? - whilst the British will nick anything that has a name on it! Then there was the emotional side of things: before I left, friends here asked if I felt emotional and I said, "Only about kenelling Simi here" as I had never left her at this end before. It's not that I didn't trust the kennels here - far from it - just that it seemed strange. [Having said that, I would never, ever kennel her here in the heat of summer; I would be worried sick about her and she would need her mum!] So I surprised myself when, coming in over the Channel, I caught my first glimpse of England in eighteen months. I saw how small the fields looked after the gorgeous expanses of Sicily and I burst into tears! And then, when I took in the green of my native isle - from palest lime green through sage to emerald and deepest forest green - I sobbed and sobbed! Those of you who have followed the blog will know that I'm not a nature -lover - give me a cityscape any day! - so it must have been quite something! I think that's enough for tonight, for those of you still here! I'll continue with my comparisons tomorrow. I've been in the UK for a week and I'm sorry I couldn't tell you here before I went but it's never a good idea, in any country, to advertise the fact that your living space will be empty. I'll write tomorrow about how I felt and the comparisons I made between the two countries. - In the form of these delightful little strawberry tartlets at the Altro Posto today. 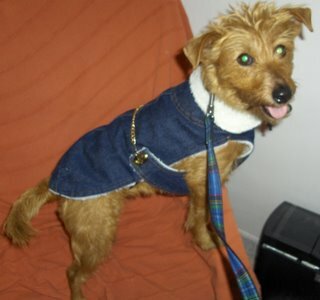 ITALIAN COAT - BUT NOT FOR ME! Simone proudly models her smart, Italian autumn coat. 1. 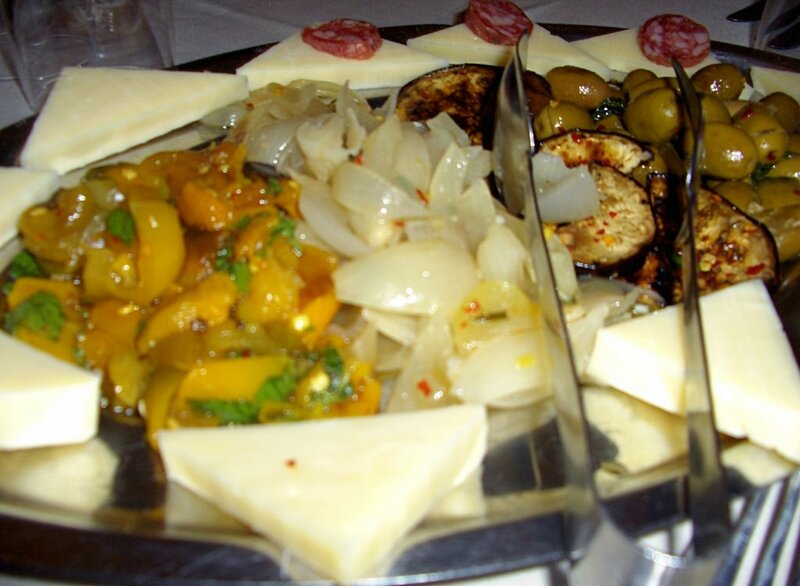 A tempting plate of antipasti. 2. 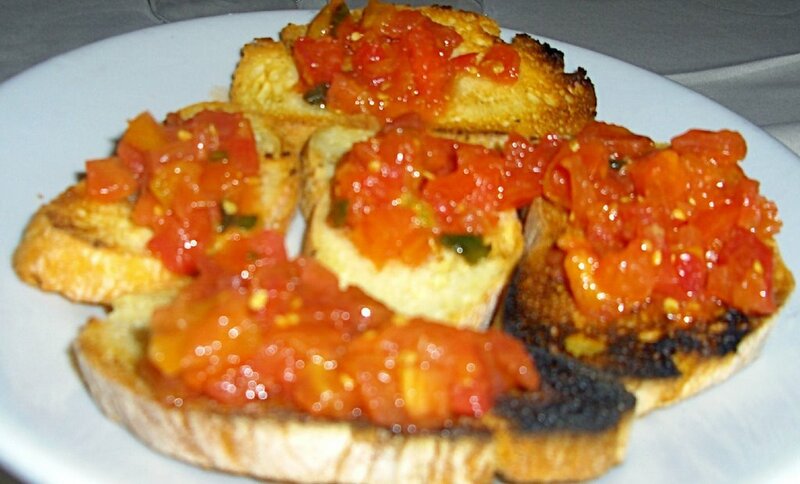 A plate of bruschette. 3. 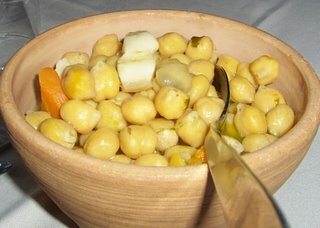 Ceci [chickpeas] in broth in a traditional dish called a nappa, which holds the heat. 1. 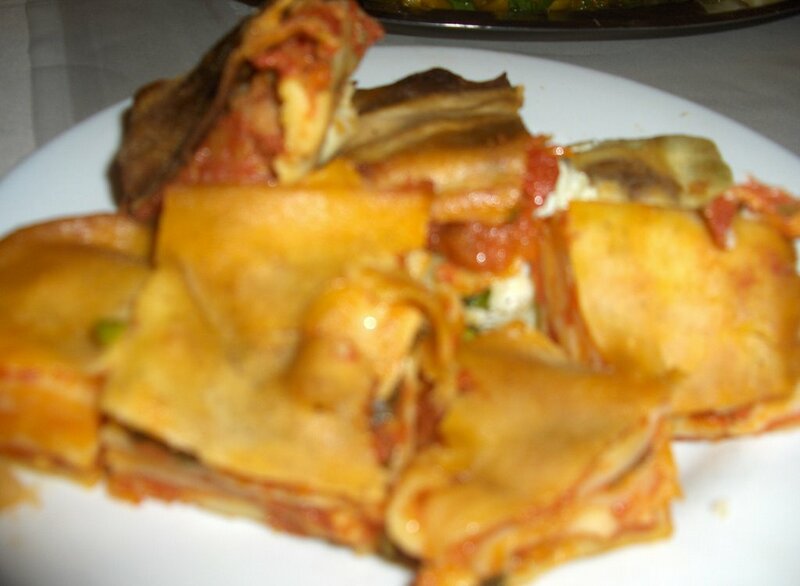 A plate of focacce. 2. 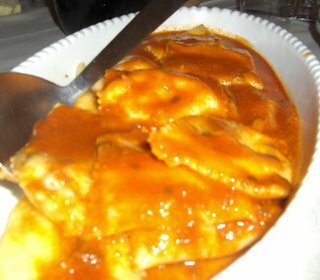 Ladling up a local dish which I love: ravioli filled with ricotta and herbs, then the mixture is sugared. The marriage of the sweet pasta and the spicy sauce is truly one made in heaven! 3. 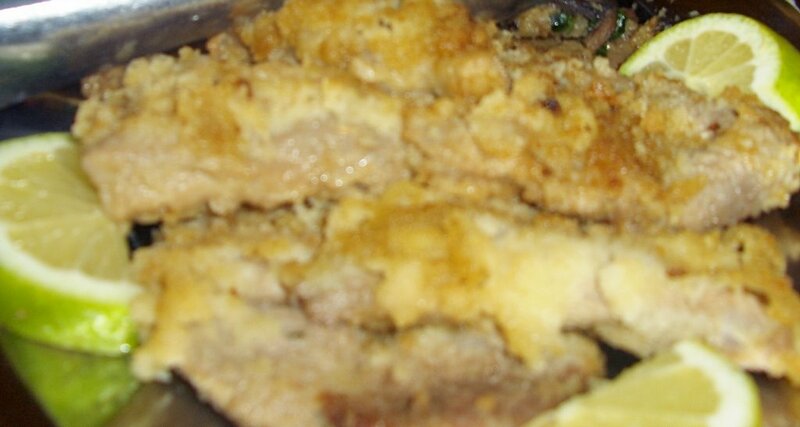 Pork coated in breadcrumbs. There were other meats, too, and lovely, black, juicy grapes to finish. - Well, almost to finish, as then Roberto's wife produced a sinful and delicious cake! 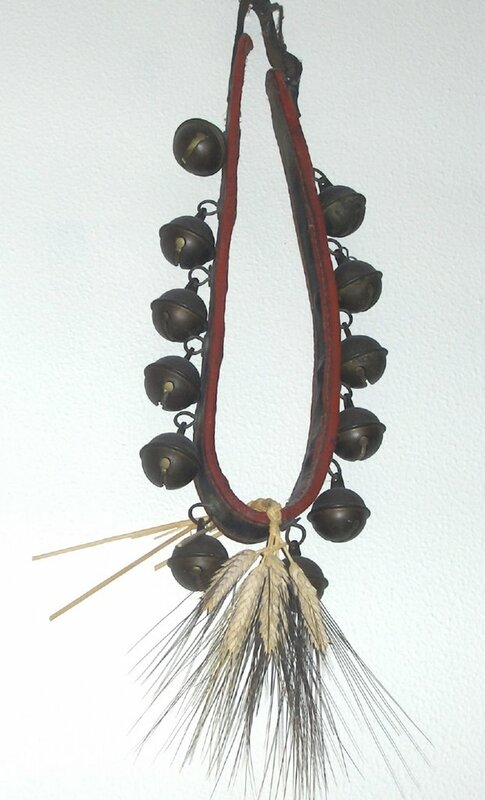 Cianciani is the dialect word for the collar of bells worn by the horses, donkeys and mules that pulled the traditional Sicilian decorated carts. 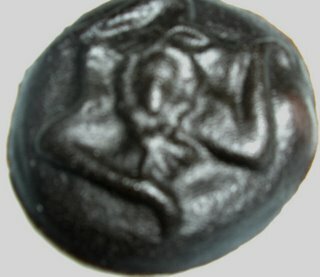 I have written here about death and mourning rituals in Sicily. During the past week, I have become more closely involved in them as, sadly, a friend in another town has lost her mother. On Thursday I went to pay a "mourning visit" to her home and to view the salma [body]. It was, I have to say, a very peaceful scene. Never having witnessed such a sight before, I didn't know quite what to say, but people were talking mostly about how serene the lady looked and commenting on the coffin and undertakers used. I was asked about the different traditions in Britain and said that probably the main difference is that most families do not have the body in the house. My friend asked where family, friends and acquaintances go to view it and then someone else chipped in, "Oh, I expect you go to the undertaker's ". I did not have the heart to tell them that only the deceased's nearest and dearest do this in Britain and that sometimes even they may not wish to, preferring to remember the person as they were. I also explained that we don't put up death notices on the wall of the house or in the town and was asked how people know when and where the funeral is. I replied that we usually phone them and / or put a notice in the newspaper. I've also observed here that a notice of condolences from the bereaved relative's place of work often appears underneath the death announcement on the walls or notice boards - a gesture of sympathy not displayed in Britain. On Friday at the funeral the hilltop church was packed, something else that does not usually happen in Britain. Only the family wore black and other mourners were not dressed up; Sicilians think that the important thing is that you are there and they are right. Just as the coffin was being carried out of the church there was the most glorious burst of sunshine and I think that lifted all our hearts. I do hope all that is true about eternal life; we are indeed to be pitied if it is not. The Sacro Cuore supermarket has reopened and I could hardly believe my eyes: all is light and bright, the floor is decent, goods are well displayed and you can actually find things. There is even a customer services desk. The place was packed this morning. What a pity, then , that there are only three checkouts and that they still make you pay a trolley deposit. [I find this extremely irritating and in Britain refuse to patronise any supermarket that does this.] It's not as if there is anywhere you could take the thing, as the exit on the one side is via an awkward flight of steps and on the other via an extremely steep slope. Both lead on to the busy Via Sacro Cuore itself and you'd soon get noticed wheeling a trolley along there! This is what you will get if you order hamburger in a restaurant. [As I've said before, don't look for the bun!] I find it very good. 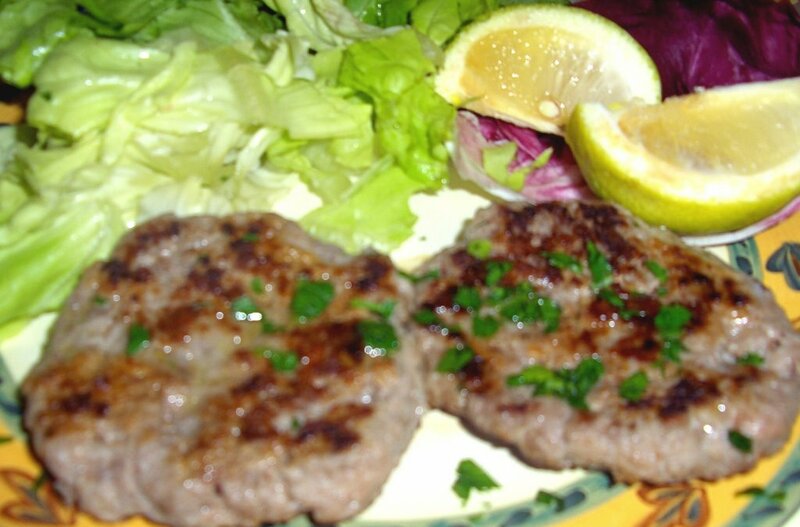 You should, though, make sure you ask, "Hamburger di che cosa?" ["What sort of hamburger?"] or you might be served hamburger di cavallo [horsemeat burger]. Italians would probably ask why eating horsemeat is more morally reprehensible than eating the flesh of other dead animals and they would have a point, but to a British person, it just is. By the way, a McDonald's opened in Modica a few years ago and quickly closed again. Against the local food, there was simply no contest. "Well done, Modicani", say I.
I have been having trouble regarding television licences in both countries: I had told the British administrators of this government ruse to obtain revenue even from those who watch little BBC that I was leaving the country and cancelled my direct debit back in May 2005. Since then I have had numerous demands for the fee forwarded to me here and I have e-mailed the relevant office on countless occasions. A couple of months ago they promised to amend their records but then I got another letter, threatening to send the heavies round to my former home in Britain [well, not quite, but you get the gist]. Upon e-mailing the office yet again, I received the reply that they "could not answer your query because you have not given us your licence number." I got stroppy then [vis-à-vis your own country you know how far you can go, and when] and replied: "I cannot give you my licence number because I don't have one and I don't need one as I'm not in Britain and this is what I have been trying to tell you! So will you please stop harassing me?!" As a result of this, I have received an apology. No sooner had I breathed a sigh of relief as that little contretemps seemed to be over, than I started receiving hassley letters from RAI [the Italian State broadcasting company], despite the fact that I had paid the fee for this year before the 1st January like the good, upstanding citizen that I wish to be. Twice I have received a letter saying that I haven't paid and twice I have sent the little card back stating that I have and giving details of my receipt. I hope it doesn't reach the stage a friend got to, where, although she doesn't even own a TV - it is just assumed here that you do and that the first object you will put in your place of residence is a set - she had to pay a solicitor to write to RAI to get them off her back. I shall be a very fed-up little citizeness indeed if I have to pay a solicitor as well as having paid the fee! As in all such matters, it is made virtually impossible for you to to get through by phone and speak to a person to clarify the situation [an irritation not confined to Italy] and you will have seen from this post that the Italians are not the only ones who can't sort their bureaucratic files out! 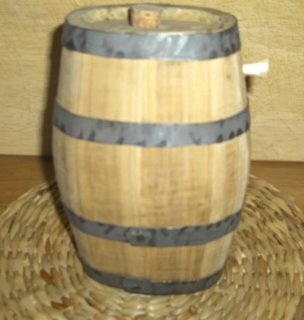 I got taken with this replica of a traditional Sicilian wine cask today, so it now adorns the top of one of my bookcases. The man in the wine merchant's - where you can take your empty mineral water bottle and have it filled with wine from a much larger version of such a cask - says the old people used to pull out the cork in the side and drink straight from the barrel. 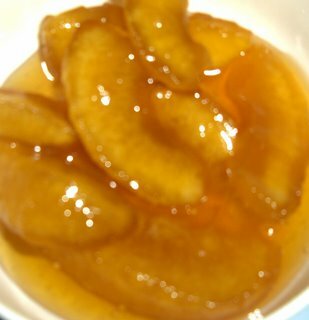 This is mostata, also, confusingly, known as mostarda. 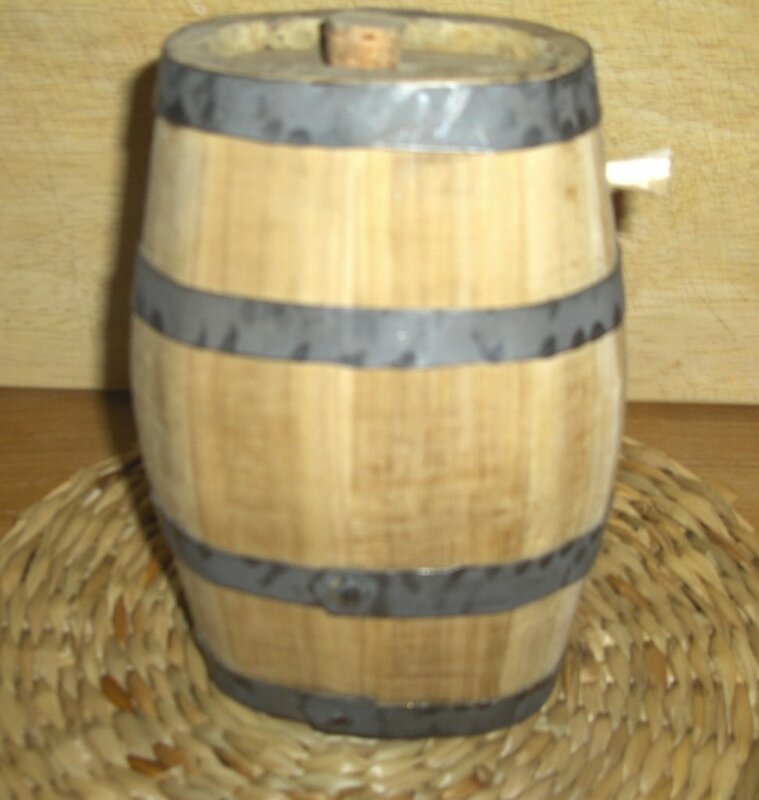 It is made from grape must boiled up with wood ashes and other ingredients such as raisins and almonds. Each province has its own way of making it. I have to say that I find it leathery and liquoricey so perhaps it is an acquired taste. The Trinacria pattern is a symbol of Sicily. This won't give you quite the authentic taste, so do buy some Mostarda Di Cremona fruits if you can find them, but all my British friends used to like this! 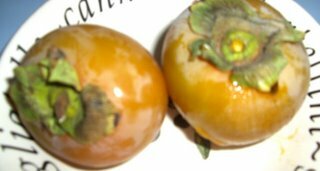 These are loti or kaki in dialect. 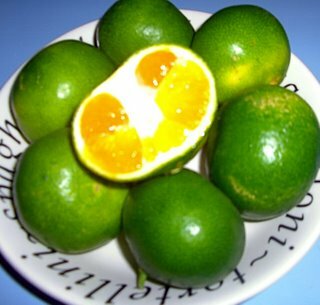 They are larger than, and do not taste like, the Sharon fruit we import into Britain. The first time I tasted them here, I thought I had found the food of the gods. Should you get any of the juice on your clothes, though, there is absolutely nothing that will get it off! - New to me, anyway. These are grown in Sicily but go by the Japanese name of miakawa, I am told. They have the taste of a sharp mandarin.